Welcome to Rent-All & Sales, Inc.! Rent-All & Sales, Inc. of Marion IL is your one-stop shop for all your equipment rental needs. From contractor equipment and supplies to homeowner equipment and supplies, we have everything you need at affordable prices. At Rent-All & Sales, Inc., we are dedicated to providing quality equipment and reliable services. 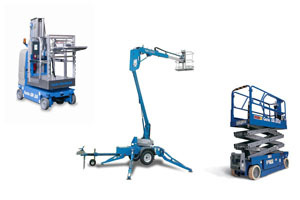 At Rent-All & Sales, Inc. we offer Aerial Lifts for rent. If you need to work high in the air we offer a variety of lifts to maximize your productivity and keep you safe at the same time. Our rental equipment inventory is extensive, up-to-date, and well-maintained so you can rent from us without worry. From aerial lift rentals to earthmoving equipment rentals, compressor rentals to compaction equipment rentals, pump rentals to generator rentals, concrete equipment rentals to lawn and garden equipment rentals, we have it all! At Rent-All & Sales, Inc. we offer repair services on privately owned construction equipment for our customers. We also offer a full delivery & pick up service to get the rental equipment you need to the jobsite or your front door. Please call us to receive a delivery and pick up quote and to schedule your rental.